After updating to version 40.,VPN never worked in my system. It always gave the error vpn is temporarily unavailable ,opera is resolving the problem. Please help me with this issue. same on mac / windows version..
tried different wireless networks (also connection over LTE). It's definitely a Opera problem. 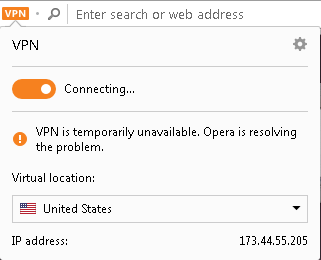 Same problem here, but Opera VPN works in Ubuntu/Linux, just not in the Windows version. Sorry this has posted twice, please delete this one. Is this a new bug or is VPN just overloaded since it went live with the stable release? 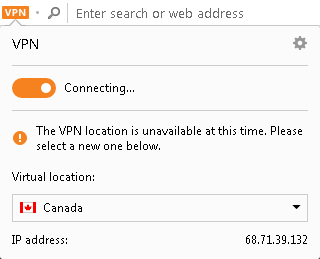 I don't think the VPN is overloaded, because it works fine in Opera under Ubuntu/Linux. Same Problem...Stuck in connecting. Opera is like Samsung....trying to deliver free vpn which doesn't work. Same for me. It's been like it for many weeks. I'm on a mac. Sierra OS. What's the problem? What do you mean by 'Both VPN addons'? So, wait, because the feature doesn't work for you, which may entirely be because of the ISP you are using and have nothing to do with Opera, that means its a scam? The mental gymnastics required to come to this conclusion boggle my mind. If you are going into this kind of discussion then please do it elsewhere. Sync apart, what requires an account, nor Opera nor any of its features require an e-mail address to be used. And besides that, Opera doesn't need to collect anyone's email addresses. A little tip: If a subject has been discussed already since a while and you don't have anything really useful to add to the discussion, then avoid doing comments on it. This way you will be preserving yours and others time. Your logic seems to be that it works for everyone who has not posted to say that it does not. I can only repeat that I was tricked into downloading Opera by a false statement and am about to uninstall it. My logic is that when there's already dozens of reports about the same issue, adding a new one just to say 'hey, it's happening to me too.' is useless and a total waste of time. Well, I told you to not go into this flame bait line. I've never managed to get the VPN to work on Windows 10 either. I've tried it on 2 PCs with no joy. It does however work on the same wifi network on the android version so that presumably rules out the ISP?